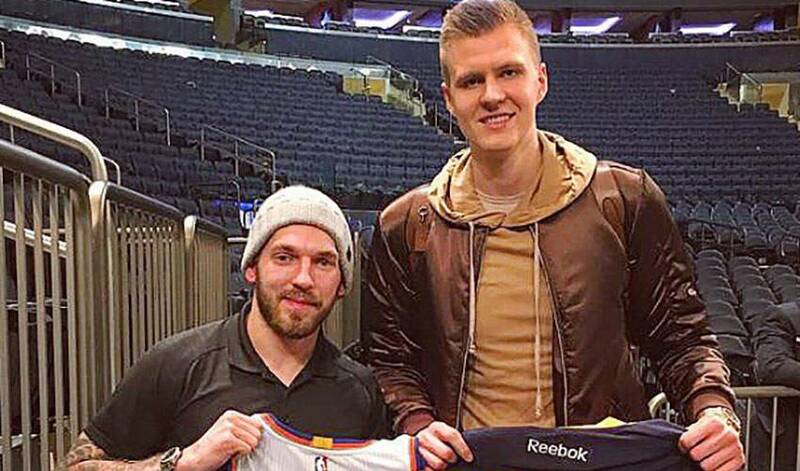 There is a distinct height difference between Zemgus Girgensons and Kristaps Porzingis, but both Latvian-born athletes have plenty of reason to look up to one another. At 6-foot-2, Buffalo Sabres forward Girgensons had to look up – way up – when he recently met New York Knicks power forward Porzingis, who stands 7-foot-3. Girgensons, in his fourth NHL season, caught up with the second-year basketball star at Madison Square Garden when the Sabres were in town to take on the Rangers in early January. The pair chatted and exchanged jerseys, with Girgensons presenting his signed No. 28 Sabres jersey for an autographed No. 6 Knicks jersey from Porzingis. Girgensons, 23, is still beaming after hanging out and getting his picture taken with his fellow countryman. Porzingis, drafted fourth overall by the Knicks in 2015, has been a force on the court since joining the NBA ranks in 2015-16. The 21-year-old finished second in voting to Karl-Anthony Towns for the 2016 NBA Rookie of the Year Award in a campaign that saw Porzingis average 14.3 points and 7.3 rebounds per game. He was also named to the NBA All-Rookie First Team. Aside from the country they each call home, both Girgensons and Porzingis share something else in common: they’ve each won Latvia’s Rising Star of the Year honour. Girgensons was the 2013 recipient, while Porzingis was recognized in 2015. Girgensons, who holds the distinction of being the highest drafted Latvian in NHL history (14th overall in 2012), knows both men can count on plenty of support from a country whose population hovers around the 2-million mark. Which is precisely what Porzingis and Girgensons said to one another at the end of their conversation. A beloved figure in his home of Latvia, a country that never sleeps when Zemgus Girgensons is playing the game.